Sleep apnea, a disorder wherein an individual's breathing recurrently starts and stops, impacts an estimated 22 million Americans. Shockingly, approximately 80% of those affected have moderate or severe obstructive sleep apnea and are undiagnosed. Given these statistics, it's alarming to know that sleep apnea can trigger side effects that can cause harm to a critical organ in your body: the brain. 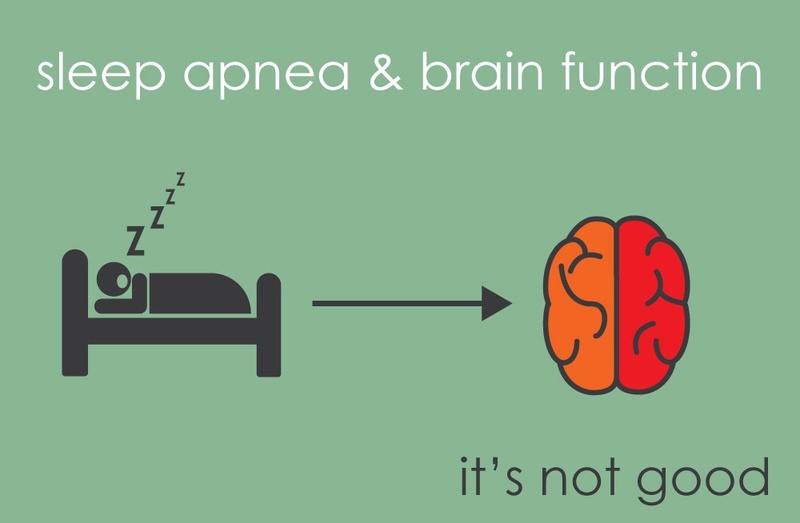 Due to the fact that sleep apnea causes a shortage of oxygen in the lungs, a body's cells subsequently cannot effectively transport oxygen to the brain. Oxygen is a mandatory chemical needed by the brain for optimal functioning. In fact, if oxygen supply disappears, some brain cells begin to die less than 5 minutes after the deprivation. Cerebral hypoxia is the medical term for the condition wherein there is not enough oxygen getting to the brain. When low levels of oxygen are present in the arterial blood, hypoxemia occurs and can cause an oxygen shortage in cells. This phenomenon can occur in a patient with sleep apnea because when an oxygen shortage occurs in the lungs, the patient's heartbeat slows. When the heartbeat slows, it needs to wildly begin beating again as soon as the individual takes a much-needed breath in order to get oxygen to the cellular level. This process turns into a dangerous cycle as the sleep apnea patient's airway continues to collapse and cause the heart to slow, then frenetically beat after the next breath is taken. This pattern is extremely difficult for the brain to cope with. It can result in a hazardous climate wherein the brain suffer from a lack of oxygen. 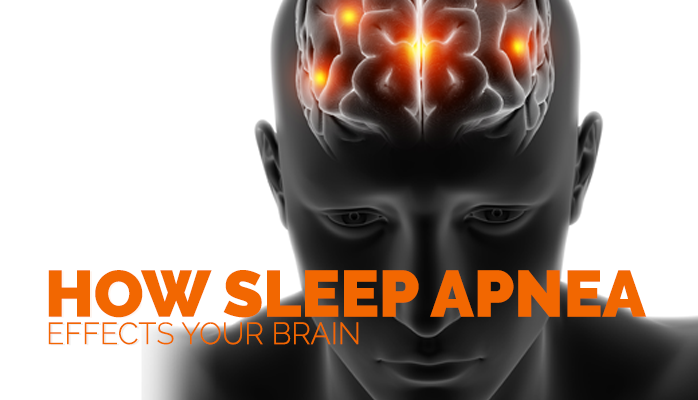 Memory loss is another possible brain impacting side effect of sleep apnea. Research conducted by Dr. Seung Bong Hong found that patients with sleep apnea had 20% smaller mammillary bodies (defined as a pair of small round bodies located on the undersurface of the brain) than did normal sleepers. Dementia can develop as a result of sleep apnea as well. A study performed by Rebecca Gelber found that those who have lowest blood oxygen levels at night are more likely to brain damage from mini-strokes that oftentimes take place before dementia is diagnosed. Individuals who spend less time sleeping deeply are more likely to show brain cell loss and brain atrophy. Strokes can be more likely for those with sleep apnea because a shortage of oxygen impacts the brain's arteries. Jessica Kepplinger led a study that found that 91% of patients who had suffered a stroke and who had sleep apnea were likely to have white matter lesions and silent strokes. More than 33% of patients who had white matter lesions and severe sleep apnea. More than 50% of silent stroke patients showed to also have sleep apnea. Epilepsy, multiple sclerosis, stroke, meningitis, and Alzheimer's disease could be caused due to the thinning of the blood-brain barrier. The blood-brain barrier is a system that carries blood to the brain and spinal cord. It blocks the passage of dangerous substances that protect the brain from infections, harmful bacteria, and neurotoxins. However, studies have found that sleep apnea causes this barrier to become more penetrable. Dangerous substances are thus more likely to access the brain causing the above mentioned conditions. The good news after being presented with these ominous facts regarding sleep apnea and brain damage is that brain damage amongst sleep apnea sufferers can be reversed. As reported by the American Academy of Sleep Medicine, a neuroimaging study has shown that white matter damage caused by obstructive sleep apnea can be helped with CPAP (continuos positive airway pressure) therapy. The results from this study showed that 12 months of CPAP therapy let to an "almost complete several of white matter abnormalities." Patients who tested in the areas of cognition, mood, alertness, and quality of life showed improvements in all areas. Due to the fact that the brain can be made better as a result of CPAP therapy, it is imperative that those who suspect that they may be suffering with sleep apnea seek treatment immediately. If treatment is put off, more serious brain damage may occur and may prove nonreversible if enough of the brain is damaged. Receiving a confirmed sleep apnea diagnosis is the first step towards brain recovery for those who may have suffered brain damage. At the Anchorage Sleep Center, our sleep specialists can help you analyze your symptoms and begin treatment after a diagnosis takes place. CPAP therapy is one of our most common routes to sleep disorder treatment and can help you attain immediate results in achieving a more restful night's sleep in addition to reversing possible brain injury. If you suspect that you may be suffering from sleep apnea or are interested in arranging your first consultation, contact us and speak with someone who can help you on your road to recovery.